How would you characterize yourself as a parent? Are you relaxed or a worrier? I am definitely a full blown worrywart. My children are some of the most important people in my life so I worry about their safety all the time. So I try to teach them safety and use products that will keep them safe as well. Now that summer has started, I have signed both of my children up for swim lessons. I want them to be comfortable and safe in and around the water. My oldest daughter, Claire, has been taking swim lessons since she was 6 months old. Aveline will start mommy and me classes in July. 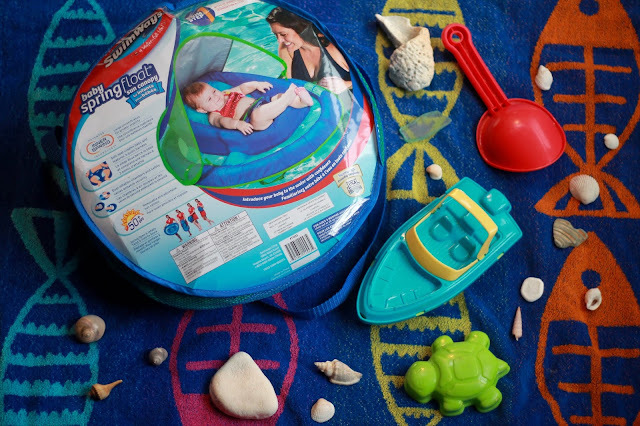 Accidents can happen around the water and I want my children to be as safe as possible especially because we love to take vacations to places with pools or beaches. Just a couple of months ago we took a trip to visit my in-laws in Arizona. The weather was predicted to be beautiful so we knew we would be doing some swimming. 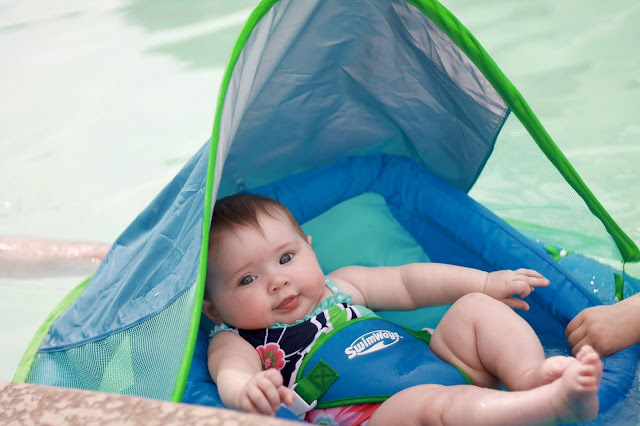 That trip was Aveline's first time in a pool so we made sure to bring our SwimWays Infant Baby Spring Float with the Sun Canopy with us when we went. 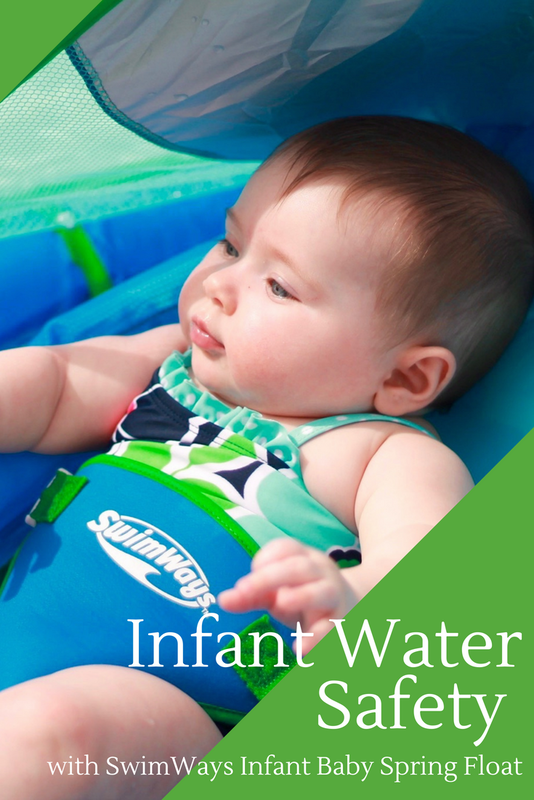 It is SwimWays fabric-covered baby float for infants between 3-9 months of age. It packs up in a fairly compact carrying case making it easier to fit into our suitcase. It was easy and quick to put together once we were at the pool, too. 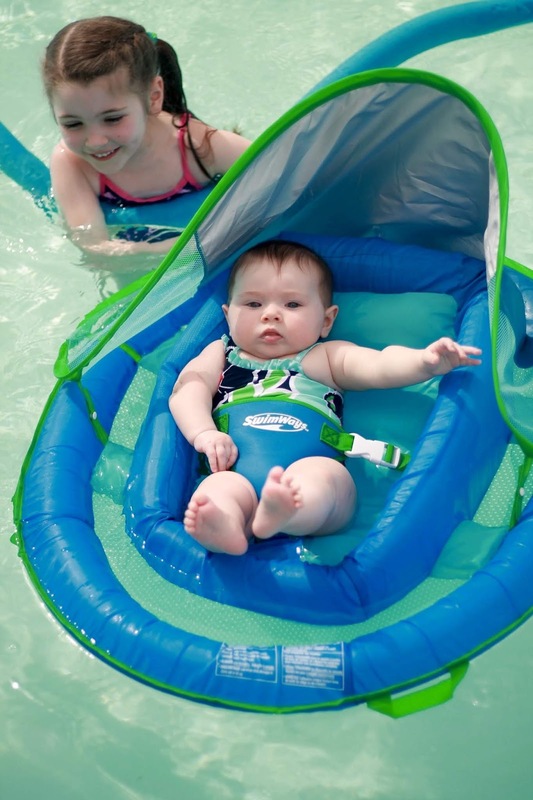 SwimWays was the brand we trusted when we were getting our oldest daughter used to the water. We bought her an infant float from SwimWays when she was little and now she has several other SwimWays items as she learns to swim. 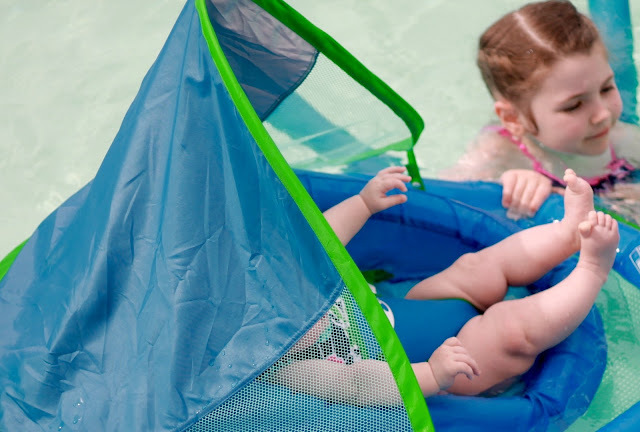 We trust SwimWays products because they are an industry leader in helping children learn to swim and promoting water safety. 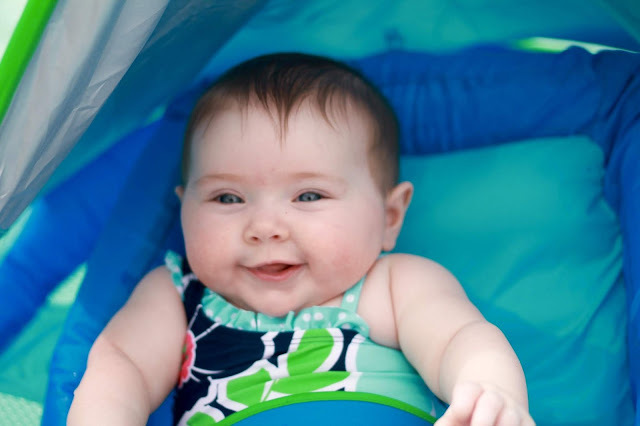 Aveline loved being in the SwimWays Infant Baby Spring Float while in the pool. 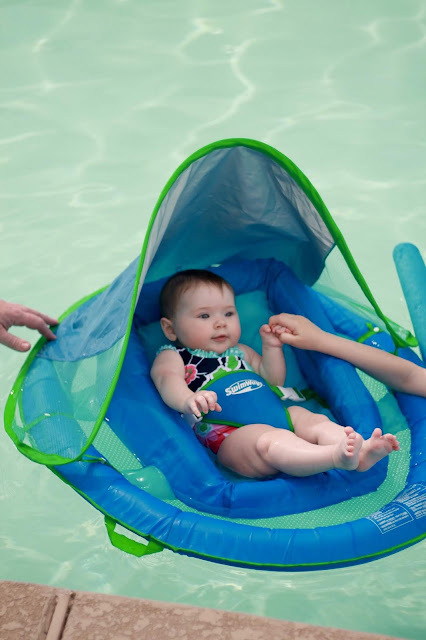 It kept her comfortable and supported during her first time swimming and really helped create a positive first experience in the pool. I loved it because I didn't have to hold her the whole time. She was able to kick and move her arms as she wanted. While she was in the float I was able to see her smiles better during her first pool time! She definitely loved being in the water in her float! The float has a 3-point harness that helped keep Aveline secure at all times. She was comfortable in its soft seat. I felt safer knowing there are additional security features including dual inflation chambers, child safety valves, and a wide base with an inner spring around the outside edge of the float to help with stability. The built-in handles helped us keep ahold of it at all times. I also appreciated the removable and adjustable sun canopy. It has UPF 50+ sun protection. Even though we always put sunscreen on our children, the added sun protection is nice to help protect Aveline's delicate skin. We are leaving for a family vacation to Florida next week and we will be sure to pack up Aveline's infant baby float then, as well. You can find resources about raising awareness about the importance of learning to swim in a fun and engaging way at the Teach Me to Swim website! We had a similar float for both granddaughters when they were smaller. Now that we have a pool, I am petrified about one of them slipping off and heading out to the pool without us realizing. We have an alarm on the door but turn it off when the kids aren't visiting. I have got to remember to turn it on when Lucia comes next time. She would think nothing of jumping right in the pool! This float is very well designed. One of ours pitched my granddaughter backward at an uncomfortable angle. This is perfect. Does is come in grandma size? Please nibble Aveline's thighs for me. Those rolls are just so tempting!!! What doll babies your little blessings are. That is one reason I can't bring myself to buy a house with a pool! My children are too young and I worry so much! Aren't her chubby thighs the best! 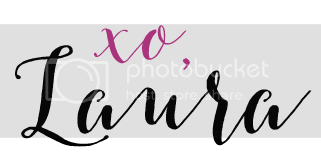 And these photos are from our trip a couple of months ago. I think they are even bigger now! I love chubby baby thigh rolls. They are so cute! What a terrific product and I love that she's shaded with the little canopy on it! We brought a baby float just like this one for our daughter. I want to get my daughter start in swim classes as while. Safety is a huge thing. Special when water is involved. Have a great week. This is sooo adorable! That float looks so fun!